What principled business leaders can do to solve America's current financial crisis. Broke is a startling wake-up call for America and an honest accounting of what our future holds if we don't take charge and change our country for the better. If the business of America is business, then it's up to our business leaders to solve the mess we're in. Broke offers practical, nonpolitical, and nonpartisan solutions that every business leader can implement today for a better tomorrow. Whether you operate a giant corporation or a local small business, you'll find practical steps to limit future risks, strengthen every business, stabilize the current economy, and help turn the country around. 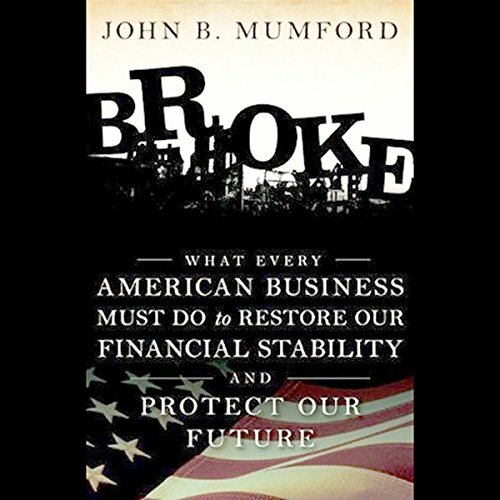 Author John Mumford has spent decades helping business leaders turn around failing companies. Now, he helps them to turn around a failing country. Includes practical, actionable steps for every business leader who wants to build for the future, while preserving the best of his or her existing enterprise. Desperate times call for creative, effective measures, not desperation. If you're a business leader, here's how you can do your part. ©2009 John Mumford; (P)2009 Audible, Inc.